Triple Eyes Engineering Co., Ltd. 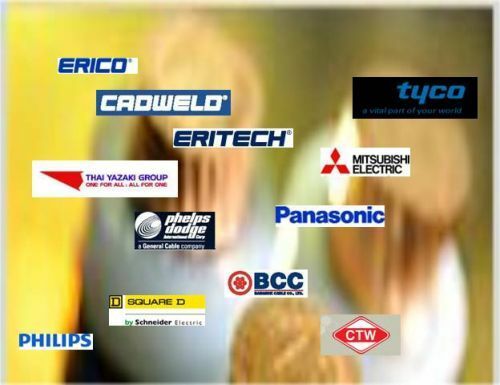 Triple Eyes Engineering Co.,Ltd is one of the most successful company in the field of cable and wires, Lightning Protection, Grounding System, High-Low Voltage Electrical Products since more than 10 years. It is our goal to satisfy our customer to deliver the requested product just in time to the best possible price based on the experience and knowledge of high-motivated co-worker. 2. Watt hour meter " MITSU", "HGE", "HOLLEY"
ท่อร้อยสายไฟ PVC สีขาว ยี่ห้อ " HACO " " EAGLE "
FUSE " FERRAZ SHAWMUT "
CABLE TIES ( BLACK ) 4", 6", 8", 12", 15"
CABLE TIES ( NATURAL WHITE ) 4", 6", 8", 10", 12", 15"
Ground rod copper bond are made by molecularly bonding pure electrolytic copper onto a low carbon high tensile steel cores with thickness exceeds 0.254 mm meet UL standard for safety for grounding and bonding equipment " KUMWELL"
Graphite mould is made from high quality material and precision machine. Tag mould provides part number, conductor size and weld metal powder size. Exothermic welding is process in which an electrical connection is made by pouring superheated molten copper alloy on and around the conductors to be joined. The molten copper alloy contained and controlled within in a semi-permanant graphite mold causes the conductors to melt. When cooled the conductor are joined in a fusion weld. The superheated molten metal is created by a chemical reaction between aluminum and copper oxide. STANDARD WALL TYPE ( SW ) มี SIZE 4" , 5", 6"
HANDLE CLAMP is used for handling and clamping the mould. WELD METAL POWDER "KUMWELL" , " THERMOWELD " , "STATIC WELD " , "CADWELD"
มีขนาด 1/2" 3/4" 1" 1 1/4" 1 1/2" 2" 2 1/2" 3" 4"
1/2" 3/4" 1" 1 1/4" 1 1/2" 2" 2 1/2" 3" 3 1/2" 4"
RING HANGER H 523 2"
SPC150DE 1 1/2" 1 3/4"
W 27" X L39" X T 0.006"
เต้ารับคู่ เสียบขากลมแบน มี กราวด์ สีขาว 16 A 250 V " WNG15923-7"
* Seals around junction boxes, flashings, service mast entries , service cable entries and countless other applications. * Highly resistant to cracking, drying and shrinking. * Cuts and trims easily. * Can be painted immediately after application. * + 20F to 212 F Workable temperator range.